The MAVS protein is required for innate immune defense against viruses. 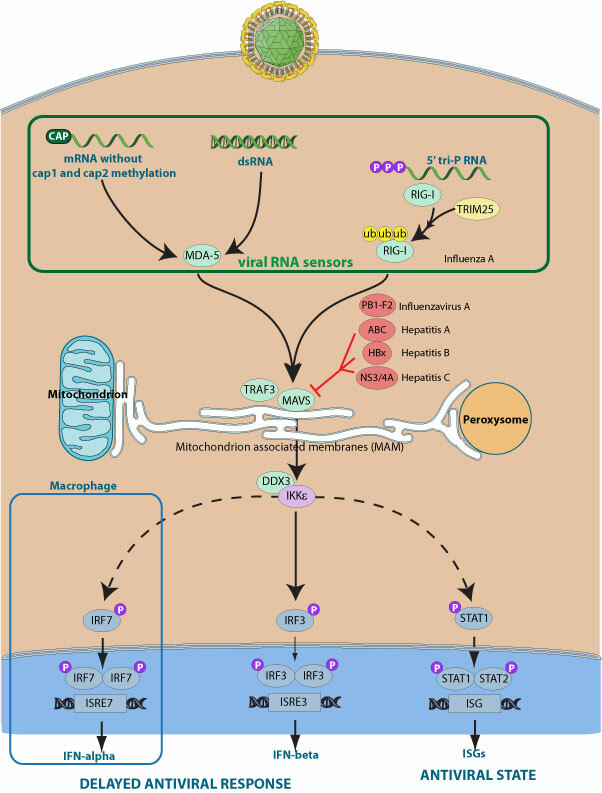 It acts downstream of RIG-I(AF038963:9606) and MDA5(AF095844:9606), which detect intracellular dsRNA produced during viral replication, to coordinate pathways leading to induction of antiviral cytokines. Alternatively, MAVS can cause apoptosis independent of its function in initiating interferon production. MAVS harbors a C-terminal transmembrane domain that targets it to the mitochondrial outer membrane. Some viruses selectively inhibit MAVS function. For example, Hepatitis C virus encodes a specific serine protease NS3/4A(P27958) which cleaves the MAVS transmembrane domain, removes it from the mitochondria thereby preventing interferon production. In a similar way, Hepatitis A encodes for the ABC protein(P08617), which localizes to the mitochondria and inhibits MAVS signaling via proteolytic cleavage.